The black Poly-Sheen Skirting for the Project-O-Stand from Dalite is a stylish and professional way to finish off your presentation when using Dalite's Project-O-Stand. It wraps around the entire stand hiding both the platform and legs and secures via a touch fastened top edge. Once the skirt is attached, you can also hide collateral material inside, between the stand legs. The material is a poly-sheen/poly-knit material that is fully pleated and features a double-stitched top edge for added durability. Should it become soiled, it can be dry cleaned. 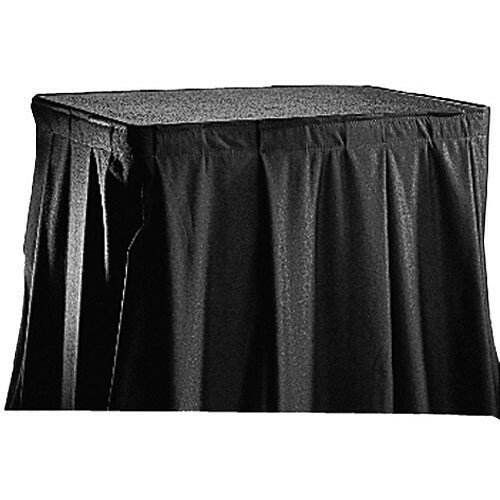 Box Dimensions (LxWxH) 17.0 x 17.0 x 3.0"
69834 Poly-Sheen Skirting for the Project-O-Stand (Black) is rated 5.0 out of 5 by 3. Rated 5 out of 5 by Adjemi from Great Quality from Great Company Quality stitching and material. Rated 5 out of 5 by HNO Productions, Inc. from Keeping It Clean Projector stand at an event. Rated 5 out of 5 by Mickey from In stock and came fast! Easy to install.